Form Description: Just as keeping your books balanced is important in the business world, keeping your family and personal books balanced is also important. One of the best ways to do that is by creating a budget that works for you. 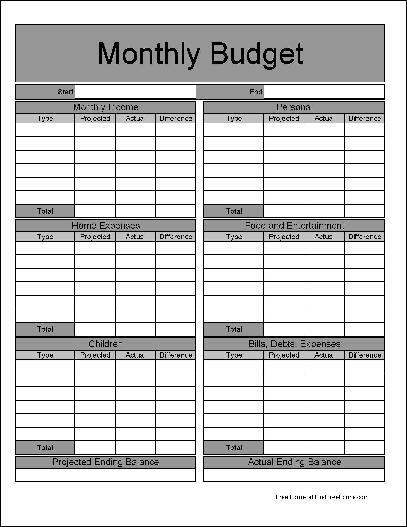 Here is a Detailed Monthly Budget that you can use to do exactly that. With this budget in hand you will be able to keep track of everything from your monthly income, to all the bills, debts, and expenses that come with any family or household. This particular edition of the monthly budget form has been created with some extra wide rows. These extra wide rows allow you an easier time of entering the information you want by hand. Definitely a huge help when you are trying to figure out the exact information that needs to go into your monthly budget. This form ("Wide Row Detailed Monthly Budget") is associated with the following keywords: personal finance, tracking, planning, budget, detailed, basic, wide row.